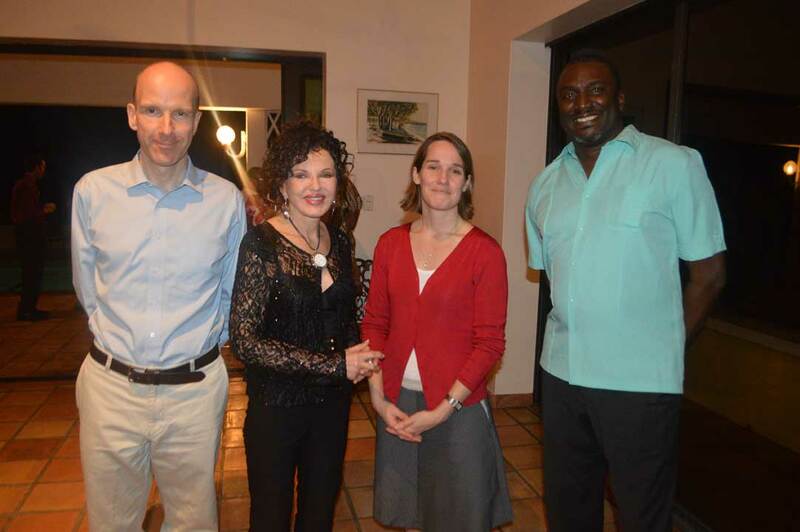 Two United Kingdom Government officials are currently on island to discuss future support for Montserrat. Today is the final day of scheduled meetings between the Government of Montserrat and Debbie Palmer, Head of Overseas Territories Department, DFID, and Ben Merrick, Deputy Director for the OTs at the Foreign and Commonwealth Office (FCO). According to a release from the Governor’s Office, discussions include practical assistance as well as the nature of future DFID budgetary and capital support and projects being developed under the UK Government’s Conflict, Stability and Security Fund (CSSF). Ben Merrick, FCO, HE Governor Elizabeth Carriere, Debbie Palmer, DFID, and Hon. Premier Donaldson Romeo at the welcome reception on Tuesday, February 28, 2017. Both officials have been visiting several infrastructure project sites such as the third geothermal well, the power station, the proposed hospital site and the port area. Briefings and visits connected with Montserrat’s safety and security will also feature. The pair said Tuesday at a welcome reception that their visit was to familiarise themselves with the status of things on Montserrat. Palmer told the gathering the intent is to ensure that they are getting the very best out of DFID’s investment on Montserrat. She said there were some very big decisions coming up around the financial support for the island and that the series of meetings will help her to make the best case for Montserrat with UK officials. The DFID official added that she was delighted to know that the government had applied to access the UK Caribbean Infrastructure Fund to facilitate the construction of a breakwater in Little Bay. “If successful this will be fantastic,” she said. FCO representative Merrick said he was visiting with Palmer to get a united view of Montserrat’s needs. He shared his appreciation for good governance and self-sufficiency being on the minds of the premier and his cabinet. The meetings, he said, are to help them think through how best to make sure these things happen. Some of the agenda topics include the child safeguarding unit which DFID is funding, plans for the hospital, and GOM’s access strategy. Central to the discussions will be an agreed joint vision between the UK Government and the Government of Montserrat which will include commitments and milestones on both sides.